Discussion in 'SecureAPlus' started by jasonX, May 17, 2016. Unable to add a drive letter in the exclusion list. Hang in some machines that is running the Windows version that is lower than Windows 10. If Universal AV is unable to parse the response file from the server, instead of showing Good News, it will display an error message in the main console. Set Good News font bigger. Set Good News dialog size according to the language. Set default directory for file browser dialog to user’s home directory. wwd, Petrovic, Der.Reisende and 6 others like this. I feel this a quite effective software after the dreadfully long first scan. I leave ClamAV engine disabled here do not see thr need for it, to many i think. wwd, Der.Reisende, revC0de and 4 others like this. wwd, Der.Reisende, frogboy and 2 others like this. In this version you may notice some color changes as we are preparing to do theme for SecureAPlus. - Sometimes SecureAPlusUI.exe crash when accessing license page. - Improve the responsiveness when showing Universal AV scan result. - Remove "OK" button from the dialog that showing the application is blocked and required admin approval. - Some pictures and colors changed to prepare for themes. wwd, RGiskardR, LowcyGier and 2 others like this. * Transfer license link does not work. * For SecureAPlus without ClamAV, user can still scan even if the Offline engine and Universal AV are off. * After user clicked on “Yes” for the following message: “For better detection, do you allow to upload any type of files to Universal AV server?”, the UI still shows only upload executable file type. The answer was recorded, but the UI was not updated. * Crash when browsing files using QT file dialog browser. * When user wants to perform manual scanning, but all the engines are off, prompt to remind the user that at least Universal AV or offline engine has to be enabled. * Change QT file dialog browser to Windows native file browser. * Change “Add” in the “Scan Settings” -> “Exclusions” to “Add File(s)” and “Add Folder”. * Update html file (include information about PUA/PUP). frogboy, silversurfer, wwd and 1 other person like this. frogboy, silversurfer, wwd and 2 others like this. - Password protection for SecureAPlus settings. - Fixed "File index service is not ready" issue in the Universal AV scanning. - Take disk and CPU usage as consideration before starting Universal AV auto full system scan upon boot-up. Universal AV will wait until the disk and CPU usage low enough before starts its auto full system scan after boot-up. Previously only CPU usage was used as the parameter. wwd, Der.Reisende, Trim and 2 others like this. Password protection for SecureAPlus settings. That's always important to protect tweaks and modifies in security software. wwd, Der.Reisende, RGiskardR and 1 other person like this. When asking for permission to upload files, Yes and No buttons are not translated to foreign language. If ClamAV engine failed to run, turn off and turn on Offline Antivirus settings, does not restart the engine. When SecureAPlus server is redirected to SecureAge Management Server, the download file for software update will follow the port that was set. In the previous version only the standard https port is supported. Change edit box context menu color, for selected text, the text color is changed from white to black, and the background is set to blue. When the computer is just rebooted, stop updating Security Center if SecureAPlus detects that it has been registered in the Security Center. Do not prompt "Would you like to refresh the engines now?" when SecureAPlus detected there is any changes on the list of Universal AV engines at the server. When one of the checked item is unckecked, the select/unselect all checkbox will also be unchecked. The number of the total engine is shown based on the number of the total active engines used at the server. Show the detail list of unknown and uploaded files in the manual scanner. - .ini file can be copied to the USB Flash Drive, where the write access is disabled from the Application Whitelisting for removable device. - When Game Mode is enabled, and upload to Universal AV is disabled, switching from full screen to normal screen will cause upload to Universal AV re-enabled by itself. - Unable to get file name information on a certain shared folder. - Remove minimized button from application whitelisting notification. - During SecureAPlus installation, do not wait until the registration to the Security Center completed. - Merge offline antivirus scan result with Universal AV when doing manual scanning. - ClamAV version 0.100.0 for Windows Vista or higher. Windows XP is no longer supported in the latest version of ClamAV. For XP users, ClamAV version 0.99.3 will be installed. wwd, Der.Reisende, silversurfer and 2 others like this. Some users reported that SecureAPlus dialogs look too big when display in the very high resolution. In this version we introduce a new feature that allow user to set custom scaling for SecureAPlus dialogs. Here are the details of the changes in this version. - Typo in software update. - Using Asteroid Belt theme, the text was not visible when prompting to scan USB flash drive. - Antivirus service crashed when scan.db file was corrupted. - Memory overrun in sanotifier.exe that sometimes caused sanotifier.exe crashed. - Set process as trusted installer on-the-fly, does not permanently set the process file as a trusted installer. - Some Polish text doesn't appear correctly during uninstallation. - In some machines, sometimes the registration as antivirus failed. - Restore minimize button in the application whitelisting notification. - When 2 USB storage devices are inserted at the same time, there will be 2 prompting to scan the USB device shown at the same time too. Modify this to show the prompting one by one, one after another. - When importing whitelist during installation, give a warning to let the user know that the system may not be boot up anymore if the whitelist is not coming from the exactly identical machine. - Non-blocking upload file to Universal AV, for Application Whitelisting prompting. - Added certutil.exe into restricted application list. wwd, Trim, jasonX and 2 others like this. We found bugs that caused some of SecureAPlus v4.9.0 components crash when run in XP, Vista, or 32-bit OS. Yesterday we temporary released version 4.9.1 to revert back some of effected components. - Resize sascanner dialog to fit 4 lines error code in lower resolution (1024x768). - Maximum custom scale is set to 200. Der.Reisende, wwd, Trim and 1 other person like this. Send troubleshooting information to the server. An option to auto upload service crash dump files. the user is still get prompted whether to trust the script. ClamAV crashed in Windows Vista 64-bit and Windows 2008 Server 64-bit. Set “Html.Exploit.CVE_2016_7241-1” as false positive for ClamAV. Do not block command line in Observation mode. Der.Reisende, wwd, silversurfer and 1 other person like this. Here are the detail of the changes. - SecureAPlus icon was not shown in some of the notification window. - Some text in the UAV scanning for unknown file in the application whitelisting notification was not translated to foreign languages. - Change the way of showing EULA. License.exe is no longer used. - In the online installer (SecureAPlusSetup.exe), change "Offline Antivirus" to "ClamAV"
- Change About translation for Russian language, from "О" to "О программе"
- Move "Universal AV" settings from "Scan Settings" to "Universal AV"->"Scan Settings"
- Improve registering as Antivirus to the Security Center, when the computer is just rebooted. - An option for uninstalling ClamAV from "Control Panel"->"Program & Features" (or "Apps & Features" in Windows 10). - Added RuntimeBroker.exe, bandizip.exe, and browser.exe to restricted application list. - Setting for enabling/disabling register as antivirus. 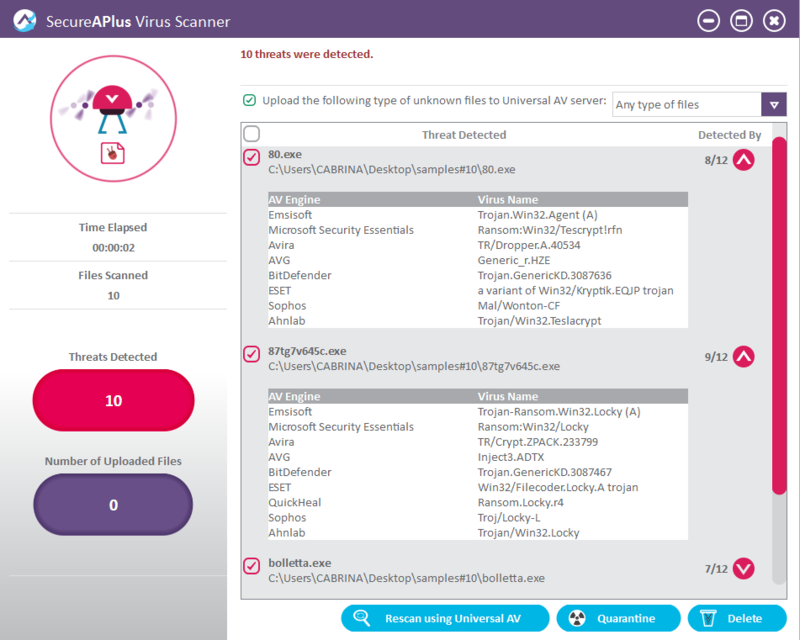 This is to allow the user to decide whether they want SecureAPlus as the only offline antivirus, or let it work together with other 3rd party offline antivirus. To allow SecureAPlus to work together with third party engine, sometimes user may need to disable SecureAPlus from registering as antivirus. Some third party antivirus may disable by itself if it detected other antivirus engine has been registered. Der.Reisende and grr like this. When whitelist a command line, SecureAPlus will automatically check whether it matches the case insensitive rule. jerzy6012.50, jasonX and Der.Reisende like this.